I'm making borders for my London 2012 quilt. 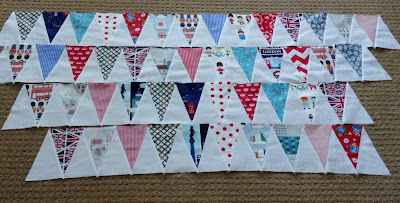 Not that I'm done putting blocks together, but I felt like sewing the bunting borders, or at least starting. I really should have gotten a lot more done than I did this weekend. But at least I accomplished this, right? I could cry looking at this. So cute and clever. So sweet! But aren't you worried about cutting off your points? Really cute, It's been fun seeing the quilt come together. Oh, my goodness! You genius, you! Love, love, love. Looks awesome, Nanette! It will compliment your quilt beautifully! Perfect border for your quilt!!! What a beautiful border, love the bunting! I'm squealing with delight....these look wonderful. You are such a clever girl! What a perfect border. I just cannot. wait. to see this quilt. :o) Every bit of it I've seen so far just looks so perfectly HAPPY. Love! Nanette, how cute! I finally listened to your interview with Pat Sloan on my iPhone while weeding my garden (multitasking!!!). Great to hear your voice! Bunting takes forever!!! It's looking great Nanette -- going to be the perfect touch for your quilt! Perfect! A perfect Olympic score for your choice! I love your blog. I just found it and looking forward to perusing it some more. Beautiful.